This article is out of date, as YouTube has released version 3 of their API. If you need a tutorial on using version 3, check out this post instead. YouTube. The third most visited resource in the world. We have all visited it and, probably, uploaded videos to it. But how can we, as Rails developers, fetch information about YouTube videos? How can we display them on our website? Are there any libraries that can help us with that? Let’s investigate, shall we? In this article, I will show you how to create a web application that allows users to add and watch videos from YouTube. Upon adding, the video’s info will be fetched automatically via the YouTube API. This app will also display these added videos using the typical YouTube player with the help of the YouTube IFrame API. Lastly, there are some potential problems and gotchas that you might face. For this article I will be using Rails 3.2.17, but you can implement practically the same solution with Rails 4.
to the application.css.scss to include the Bootstrap styles and scripts. Of course, in a real application you would choose only the required components. dislikes – integer. Dislikes count for a video. That will be enough for the purposes of this demo, but keep in mind that the YouTube API allows you to fetch a lot more information. We will not need the edit, update, show and destroy actions for the purposes of this demo. Also, do not forget to remove the public/index.html file if you are working with Rails 3. When a user visits our website, the first thing he probably should see is the “Add video” button. Thanks to Bootstrap, this block will look pretty nice. The next step is to implement the new action. Nothing fancy going on here. It is time for the fun part – extracting information about the video specified by the user. We are going to do this inside a callback before creating a record. All these URLs point to the same video with the id 0zM3nApSvMg (you can read more about it on StackOverflow). This is where youtube_it comes into play. First, a client variable is being created – it will be used to issue queries. You might be wondering “What is a YouTube developer key?” This key is used to issue queries against the public YouTube data. Please note that some actions require user authorization, which you can read more about here. To get your developer key, register a new app at https://code.google.com/apis/console. Open its settings, go to “APIs & auth”, then “Credentials”. Create a new public key for browser applications, which is your developer key. After initializing a client, fetch the video using video_by, getting the information about it. Note that the video’s duration is presented in seconds, so we have to implement a parse_duration method to format it the way we want. At this point our app allows users to add their videos. It also fetches some info and provides validation for the user input. Nice, isn’t it? The #player-wrapper is an empty block where the YouTube player will be shown. The in_groups_of method groups our records by 3 and to displays them in rows. Please note, if there is not enough elements to form a group, Rails replaces each missing element with nil, so we have to add a if video condition. https://img.youtube.com/vi/<1,2,3>.jpg – 120×90 image with different scenes from the video with black stripes above and below the picture. Also, when rendering video preview images we are storing video’s uID using HTML5 data-* attribute. This attribute will be used shortly. First of all, we initialize the ytPlayerLoaded boolean variable which checks whether the player has been loaded. After that, create a makeVideoPlayer function which takes one argument – the video’s uID – and creates a YouTube player or changes the video being played. If the player is not yet loaded, we append a new #ytPlayer block to the #player-wrapper which is eventually replaced by the player. With all that in place, finally create the YouTube player object assigning it to the ytplayer (we will use it to call API functions). events – here we specify two events to handle. When the player has loaded (onReady), set ytPlayerLoaded to true. If an error occurrs while loading the player or video (for example, this video was deleted), alert the user. If the player has already been loaded, we use loadVideoById function to change the video being played and then pause it using pauseVideo (for demonstration purposes). This google.setOnLoadCallback _run means that the _run function should be called as soon as the API has finished loading. If we do not use this callback and try to load the player as soon as DOM is ready, an error occurs stating that YT.Player is not a function – this is because API has not loaded yet. And that is all! Now our users can add videos and watch them on our website. With this structure we are delaying firing this event by 500ms. This brings us to the end of the article. 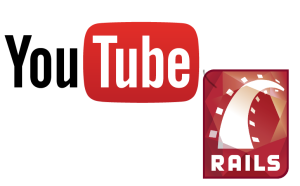 We talked about the youtube_it gem which can be used to work with the YouTube API and about the YouTube IFrame API. I hope that information provided here was useful. Do not forget to share your opinion about this article in the comments. See you again soon!